Attention teachers…this one’s for you! It’s that time of year again…(some may be looking forward to it and some may not). Teachers & schools are beginning preparations for the upcoming school year. I have seen many of my teacher friends on Facebook begin to decorate their classrooms by using a certain color scheme, theme or the use of inspirational phrases painted on furniture throughout their room. Does your classroom have a bulletin board? The great thing about bulletin boards is that they are simple to change-up whether it is seasonally or to go with a particular theme you are covering with your class. 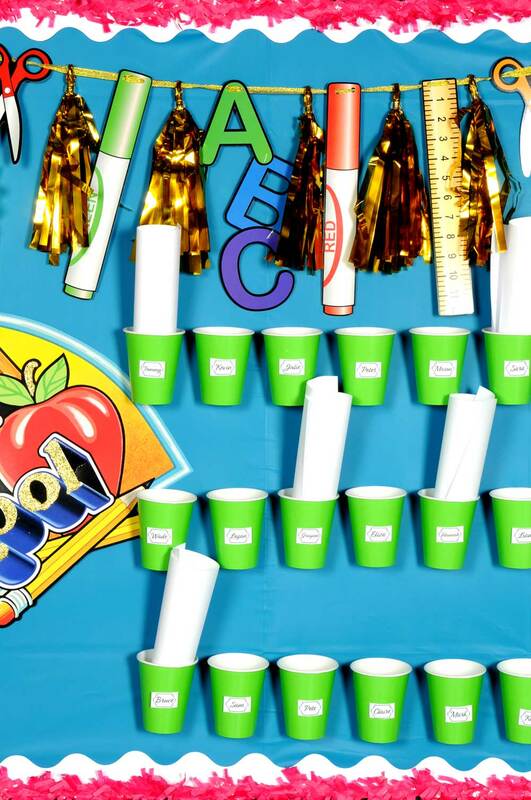 Here’s an idea for how you can create a back to school bulletin board to coordinate with your classroom! From what I have seen, most people use a colored paper for the backdrop/canvas of their bulletin boards. However, there is another option…you can use plastic tablecovers! These are great because there are many color options to choose from and they are very inexpensive. For my bulletin board, I went with a bright turquoise tablecover to go with my bright color scheme. Around the edges, I used the back, non-printed side of our Spring Border Trim. I covered that with some Cerise Tissue Festooning to coordinate with my other bright colors. Festooning is another wonderful and inexpensive item to use when decorating bulletin boards. Again, lots of colors to choose from. In one corner of the board, I used a few flowers off of our Tissue Flower Garland. 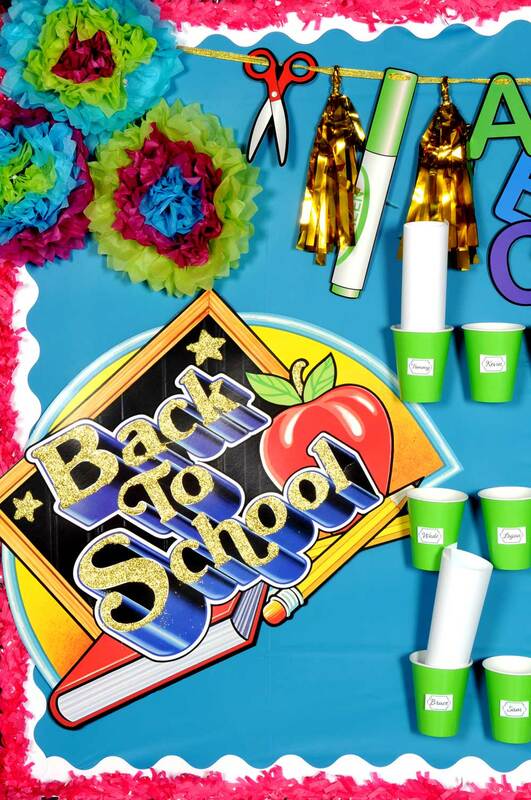 I then created a custom, back to school banner using our Gold Metallic Garland and the School Days Cutouts. (This turned out really cute)! I simply removed all of the tassels from the garland, punched holes in each cutout and reassembled the garland alternating between a tassel and a cutout. 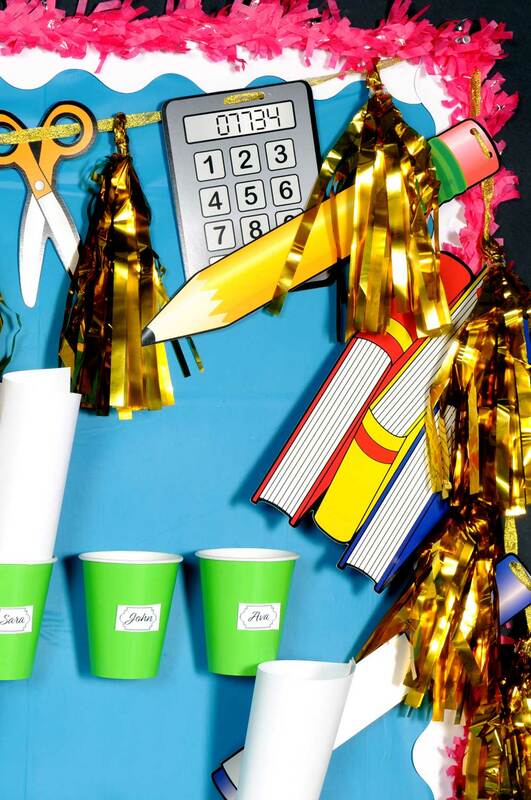 Tip: This concept would work for literally ANY tassel garland & cutout set. Create a custom, one-of a kind banner with your favorite items! Although this was a great idea, I can’t take the credit for it. My creative co-worker, Tara, came up with the concept and was nice enough to share it with me…. (thanks Tara)! You’re probably wondering what in the world cups are doing on my bulletin board? I thought that as a way to save space in your classroom, you could create small “mailboxes” for each of your students, right on your board! 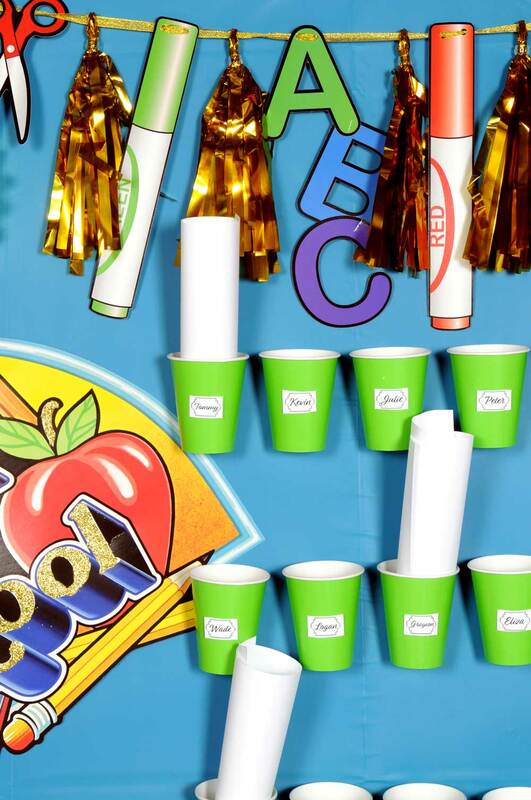 Cups can easily be stapled on to a bulletin board and labeled with each child’s name. 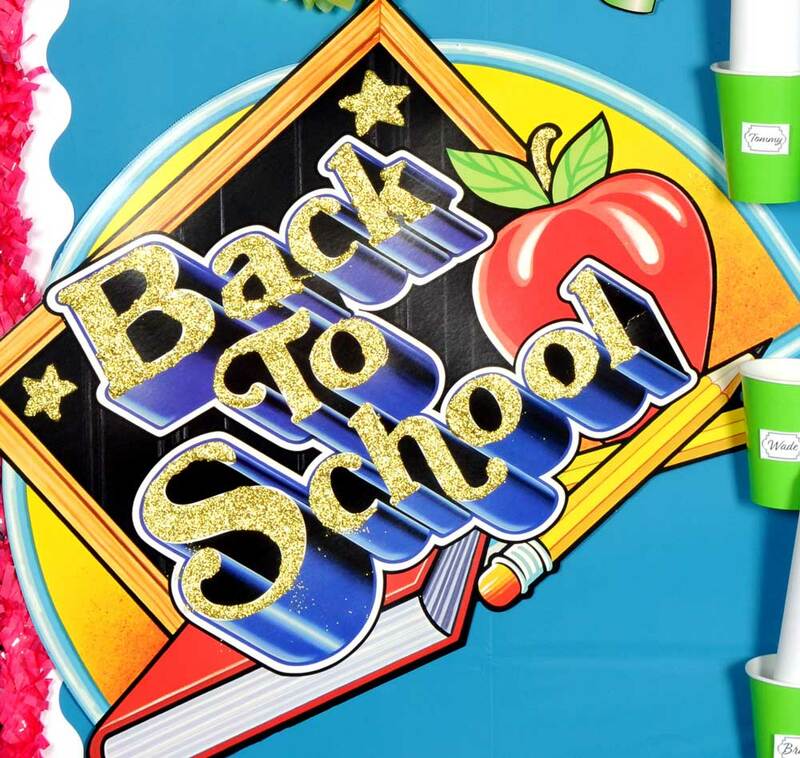 For the first day of school, prepare each cup with a pencil, eraser, pen & other goodies! (I think the kids would love it). For the last section of my board, I used our Back To School Sign, but added glitter! I made it gold to coordinate with the Gold Metallic Tassel Garland in my custom banner. 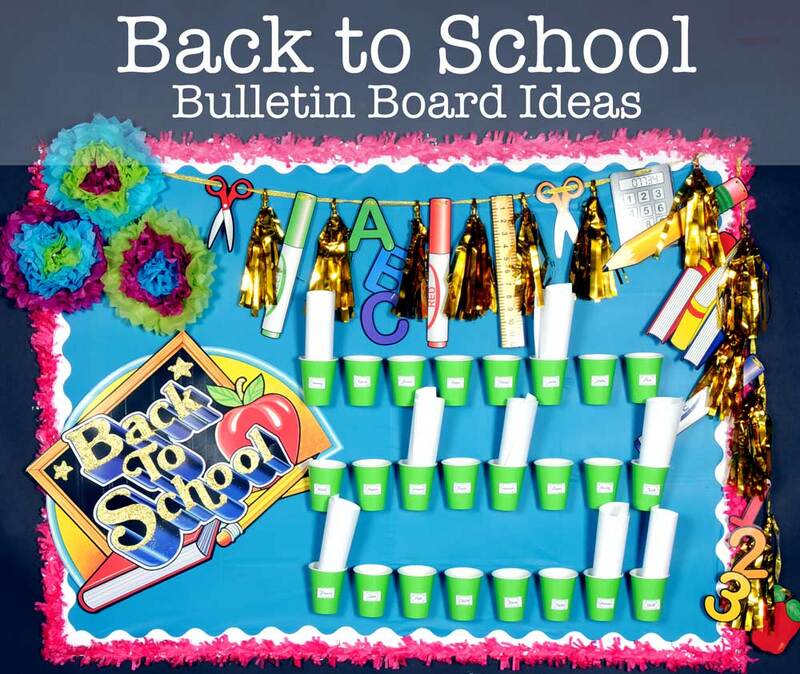 I really hope you enjoyed our ideas for decorating your classroom’s bulletin boards! If you like these ideas and would like to keep updated on future posts, please subscribe to the blog (you can enter your email to subscribe on the “Home” page). Please feel free to E-mail me pictures of your own bulletin board designs & ideas. I’d love to see how you use our items!